Oh my gosh–isn’t this loaf the cutest?!? I’m not in the know with most Scandinavian baked goods, so I wasn’t sure what to expect with Beatrice Ojakangas’s Finnish Pulla bread. Never heard of it, but I was pretty pleased to discover this baby when it came out of the oven. It’s a little bit buttery, a little bit sweet, a little bit eggy and scented with cardamom, one of my favorite spices. Pulla is often shaped into a glorious braided wreath, but I made half a recipe, so I did a loaf instead. The recipe didn’t suggest making the dough ahead of time, but I wanted to take care of it on Saturday night so I could have fresh-baked bread with jam for breakfast on Sunday morning. I made the dough all the way through the shaping stage (it was a dream to work with in the cooler temps), then put my braided loaf on a parchment lined sheet tray, loosely covered it in plastic and stuck it in the fridge before I went to bed. Early Sunday morning, I took it out and left it on the counter to come to room temperature for a little over an hour before I baked it. Seemed like a good strategy. Pulla reminds me of challah, but with cardamom and pearl sugar (which I bought at an IKEA in Jersey about a year ago and until Sunday had still never used). I’m glad to have this recipe on my radar now, and I bet leftovers will make good French toast (or will that be Finnish toast??). For the recipe, see Baking with Julia by Dorie Greenspan or read Erin’s The Daily Morsel. Don’t forget to check out the rest of the TWD Blogroll! Looks a lovely loaf! Would be lovely Christmas morning. Pretty! I like the look of the little loaf. Your loaf version looks fantastic!!! What a beauty! As always, a gorgeous loaf! I like the idea of Finnish Toast for breakfast! A loaf is a great idea. So glad to hear that it works making it the night before and then baking in the morning. The idea of a freshly baked loaf in the morning is wonderful. Am definitely trying that the next time I make it. I’m making more loaves to give as gifts! I just love the way the cardamom makes the house smell! Your loaves are absolutely gorgeous! oh thats good to knwo.. that you can do all the work the night before and then have it hot from the oven the next morning.. love that deep colour on yours.. gorgeous!! Your loaf is beautiful! Good to know it can be prepped the day before. I want to make this for my Aunt and bring it the same day it is baked. ~Happy holidays! Oh! So glad to know that it worked out when shaped in advance. This would be so lovely fresh for a Sunday brunch! The perfect Sunday morning recipe. …actually, it’s so good that it should become the perfect breakfast recipe…anyday! Your pulla looks absolutely delicious. Gorgeous photography. 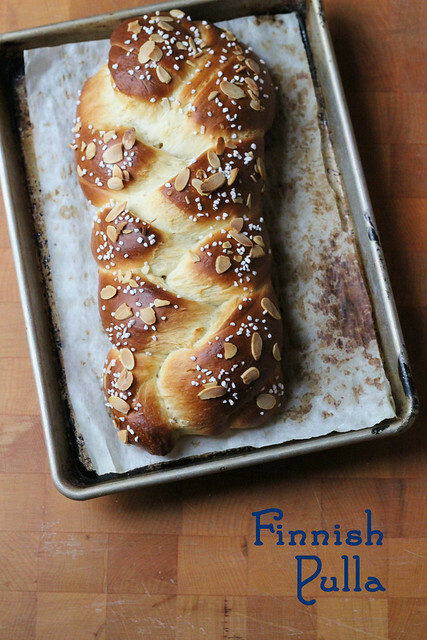 Your Pulla looks wonderful, I love the sliced almonds on top! It’s a keeper to make in different times and it will be perfect for Christmas breakfast! It is a really cute loaf! It is definitely a keeper bread! I was also wondering about leaving it over night — glad to know it worked out! Blessings and Merry Christmas. Looks absolutely beautiful…great to know it can be prepped the night before. Happy Holidays!! Thanks for the tip about keeping overnight in the fridge. I want to make again for a party and was wondering if it would work- I guess it does since yours looks lovely. Your loaf looks beautiful.. I also made 2 loaves instead of wreath.. I loved this recipe, it is good to know that you can prepare it in advance and bake in the morning.. Thanks for letting us know.. I think this is the perfect breakfast bread with jam.. 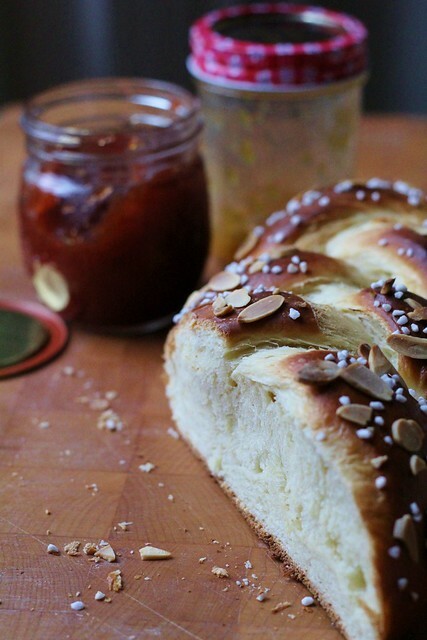 The pulla looks great as a braided loaf. We didn’t have any left over for French toast. It’s good to know that you can refrigerate the dough overnight and bake it in the morning for breakfast. I think it’s perfect for a brunch. Beautiful! I like the idea of baking in the morning. There is nothing like freshly baked bread. It looks wonderful. I just ran out of time but I will be making this. Love cardamom. And the idea of the pearl sugar. My mum in law is Finnish so I really enjoy a good Pulla. Soooooo nice. She makes them and keeps them in the freezer so when guests come round she can heat one up a little and it’s just like it was freshly baked that day. Hi, I’ve nominated you for the Blog Of The Year Award 2012!! Please check out my blog for more details! I have to check out the pearl sugar at IKEA next time I go. Thanks for the tip. And beautiful loaf! Thank you for sharing ..!! i like it ! !